Recycle with Polygroup’s Christmas Recycling Program. Ship them your artificial Christmas trees, old Christmas lights and extension cords, and they will upcycle them into products like bubble wrap and plastic bags. Make the most of your artificial Christmas tree (and help the environment) by reusing the tree as many times as possible. As long as you take good care of it, it could be with you for years. If your artificial tree is still in good shape, consider donating it to a thrift store rather than throwing it out. You could also consider selling it online. November is the best time, but eBay has hundreds of listings year-round. If your artificial tree is in rough shape after many years, remove and save the limbs that are still in good condition. They can be used to create smaller holiday decorations such as wreaths. Fake Trees: Greener Than Real Trees? There’s no clear winner in the debate about whether real or fake trees are the more environmentally friendly choice. Some people say it’s fake trees because using them saves cutting down one tree for every year you use them. But others say real trees are best because they can be turned back into mulch, instead of filling up landfills with plastic. The only clear green choice is to skip fake or real trees and get a living, potted tree instead. 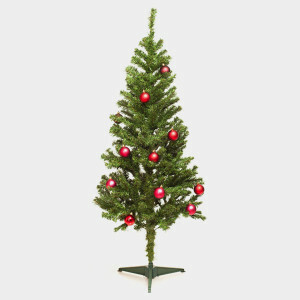 The first artificial Christmas tree made from brush bristles was manufactured in 1930 by the Addis Brush Company, using the same machinery that it used to make toilet bowl brushes, the only difference being they dyed the bristles green.